In a future world, vampires reign. Humans are blood cattle. And one girl will search for the key to save humanity. Allison Sekemoto survives in the Fringe, the outermost circle of a vampire city. By day, she and her crew scavenge for food. By night, any one of them could be eaten. Some days, all that drives Allie is her hatred of them. The vampires who killed her mother and keep humans as blood cattle. Until the night Allie herself is attacked - and given the ultimate choice. Die...or become one of the monsters. Faced with her own mortality, Allie becomes what she despises most. To survive, she must work with her vampire creator and learn the rules of being immortal. Including the most important: go long enough without human blood, and you will go mad. When Allison is separated from her creator, she flees into the unknown, the world outside her vampire city, beyond the wall. There she joins a ragged band of humans who don't know what she is, seeking a legend - a possible cure to the disease that killed off most of humankind and created the rabids, the mindless creatures who threaten humans and vampires alike. I've not read any vampire paranormal in awhile. I feel like it's all been done and there isn't much new and fresh to add to the mix. 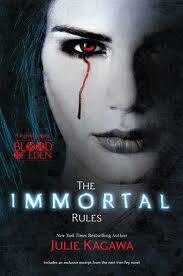 I was intrigued by The Immortal Rules because it had a dystopian twist to it. I'm sad to say that there still wasn't anything new to offer. The story is pretty slow. You're just waiting for something big to happen the whole time or for a secret to come into play. When Allison opted to be turned into a Vampire I was almost mad at her. She was fighting constantly against them, now she wants to be one just so she won't die? Yet becoming a vampire she would be dead anyway? It didn't seem to fit with her early character traits. The story is through Allison eyes as a new vampire. I honestly didn't see much blood lust and it was so convenient when she did feel it that some bad guys were close by for her to take down. I'm also confused how she could live with humans for so long and not drink their blood or that they didn't know what she was. The romantic aspect is very small. I was hoping that maybe the love interest would be more appealing. The length of the book seems much longer than necessary and I just felt like I was waiting most of the time. I'm not a true vampire lover and was hoping this would change my mind, but it really hasn't. I was expecting so much more with all the hype surrounding it. This is a book that didn't live up to it. "Hunger flickered, always there, but I pushed it down. I was a vampire. Nothing would change that. But I didn't have to be a monster." I enjoyed this one, but I felt much the same as you. I was angry at Allison for turning Vampire, too. But I did think it was a good book, overall. Great review!